Like most people, I looked at day's prompt and thought "what the hell is that suppose to mean, we've already been inspired by colours - the first six days was just colours!" 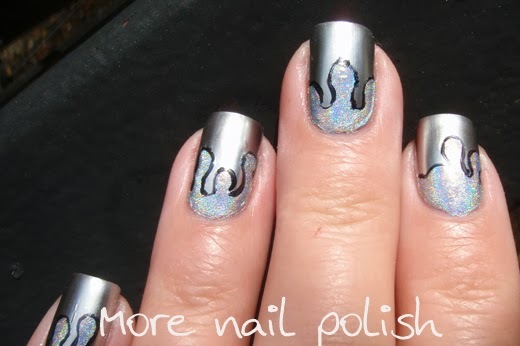 So the very next thing I did was check was check out how Sarah from Chalkboard Nails (after all, she's the reason I decided to attempt the challenge) had interpreted the prompt in the previous two years. She I took it to mean "be inspired by the name of a polish color" and I liked that interpretation, so I went with it too. I was inspired by the colour T-1000 by Dance Legend. 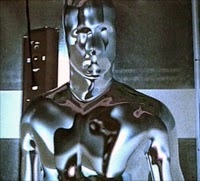 In case you have never seen the movie Terminator 2, the T-1000 is a terminator from the future made of liquid metal. 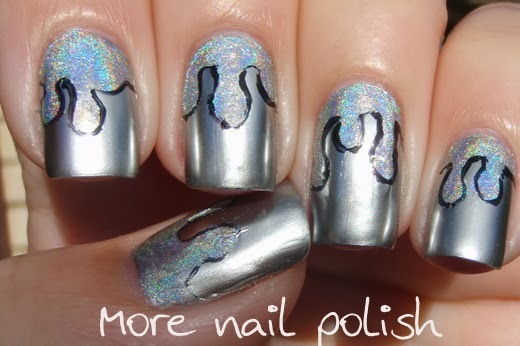 I used Layla Mirror Effect Polish in Metal Chrome as my base colour. 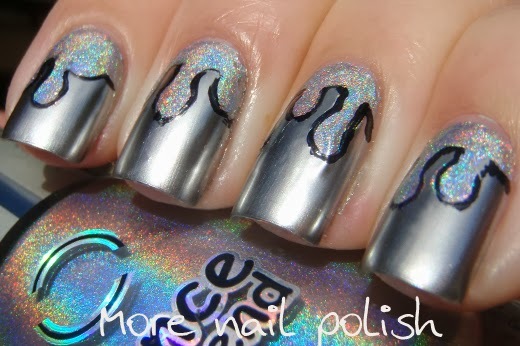 I then added drips from my cuticle edge using T-1000. I decided to outline the drips with black polish and a fine black brush. I'm sure this would have looked better if I had a black nail art pen - I'm going to have to invest in one of those! 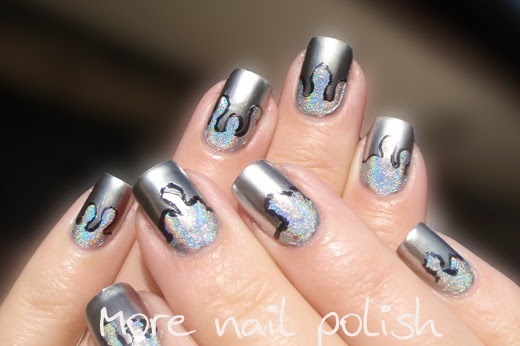 The idea was to try give the appearance of liquid metal dripping on my nails. This actually looked good in real life, but I'm not sure if that translates onto these photos. 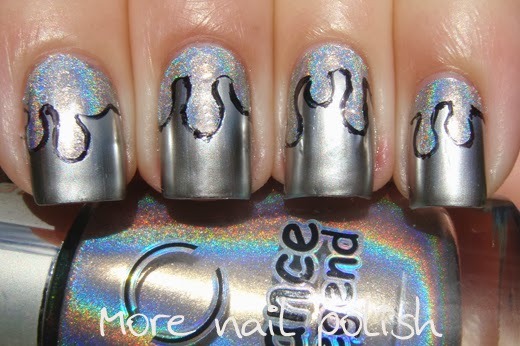 I wore this mani over a clear gel base and with no top coat, and the wear was excellent. In the past the Layla Mirror polishes have flaked off very quickly, but putting it over a gel base really made the polish last, I had zero chips on this mani when I took it off. No laughing at my right hand in this next photo ok, doing fine outlines with my left hand was nigh impossible! This is cool, as soon as you said The Terminator I got it! I love this! The chrome effect is awesome and I love the combination of silver textures! Hey, I just watched this movie. :-D Great idea! I love The Terminator! I kind of want to go watch it now.. It looks very cool! 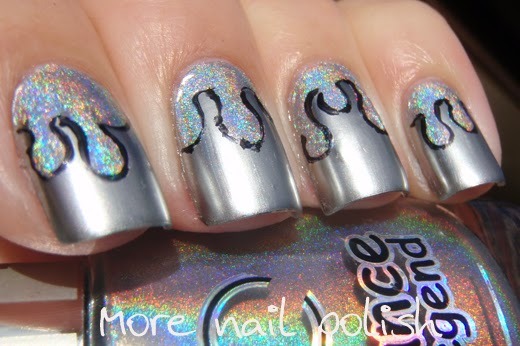 Love the holo :).